When Dominique locks up at night, he turns the door latch on his 34- foot Safari motorhome and counts his five companions before switching off the light. 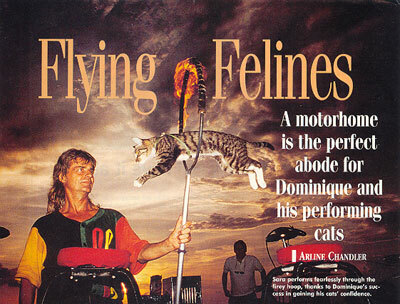 Dominique's house cats, as he describes them, are not only his family, but the stars of his on-the-road act, "Flying Felines." Originally from Paris, France, Dominique (who goes by that name alone) makes his home base in Key West, Florida, where he and the cats perform year-round on the Hilton Hotel Pier. "Every evening, people gather for the famous Key West sunsets," he says, noting that up until the past two years, his house cats took their flying leaps on the water's edge at Mallory Square where craft artists line one side of the pier and performers the other. At least four times a year, Dominique unhooks their rolling home from his marina address and heads for show dates at the Renaissance festivals in Atlanta, Georgia, and Largo, Florida, as well as hotels in the Orlando area. In 1992, Dominique and his cats worked a three-month stint for Walt Disney World in a circus act on the park's Pleasure Island. Most recently; he won the hearts of cat lovers at Silver Dollar City's World-Fest to crowds caught up in the culture, crafts, music and food of 20 countries representing six continents. From an RV park near the 1890 reproduction mining town at Branson, Missouri, Dominique drove his motorhome each morning to the employees' lot. Between shows, he shuttled the stars of his act back and forth from their air-conditioned coach to an open-air stage marked off on Silver Dollar City's town square. While the kitties snoozed in the comfort of their familiar surroundings, Dominique strolled the park and fantasized about the similarities between his homeland and the old buildings and rock walls characteristic of the Ozark Mountains during the last decade of the 19th century. As a youngster growing up about 20 miles from Paris, Dominique loved animals and tried to figure out what was going on in their minds. In his youth, he studied drama, mime, opera, acrobatics and dance. He per- formed in such well-known venues as the Lido in Paris and the Savoy in London before accepting a contract that took him to Canada for five years and then, two decades ago, to the United States. His background as a European-style clown is evident in exaggerated moves and French-accented commands for his cats to "remember your lines!" the doors of their cages in their own good time. Dominique admits that he travels to work, but he also works to travel. "Because I am in show business, I chose to live in a motorhome so I could see the countryside," he says, reflecting that he once traveled by air to his show dates. "In a house, I felt trapped," he continues, noting that he and his cat family have lived and traveled in a motorhome for at least 10 years. "Constant togetherness is necessary in gaining the trust of these feline friends. Our coach is like one room. There are not as many places for them to hide." To accommodate his four- legged house mates, Dominique removed the carpet in his roving residence and installed a hardwood floor. "I cover the living area with cheap rug, then I throw it away when it needs to be changed." Dominique credits his now- 25-year-old daughter with putting cats into his act "At age five, she wanted a kitten and I bought her one," he recalls. "At the time, I performed a one-hour show as a clown. I decided to train the cat and give him five minutes in my act. After two months of practice sessions at home, he was ready," or so Dominique thought. "But the first show in a high-school gym panicked the cat and he ran away, so I entertained alone. Afterward, I retrieved the frightened kitty and brought him back for more training in front of a crowd." The experience taught Dominique that the tricks rank second to conditioning the animals to be around people. "Cats are skittish," he says, explaining why people's pets do tricks at home, but hide when visitors come around. Over the past decade, Dominique's feline family has grown. Sara had been abandoned at a rest stop. 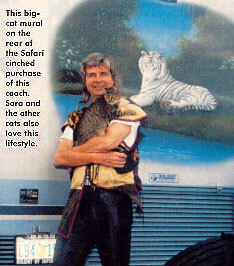 "I liked her, she liked me, so I invited her to join the other cats in our motorhome," he says. He introduces the rest of his traveling troupe: Sharky, a purebred silver tabby from Michigan; Oscar, a solid-black jungle cat born to a mother in the wild; Cossette, who has no tail; and Piggy, a solid-white American shorthair, from a litter in Miami. Dominique says the cats get along well in their travels. "They groom each other, then they fight," he adds with a laugh. Dominique lost some of his stars along the way. Marlene, a quick study for tricks, had no fear. About 10 years ago, she attacked two dogs who killed her. At the time, he had other felines in training at his home in Key West. "I called a conference with my cats and said, 'Tonight, all of you are going to jump through the hoop of fire in memory of Marlene. And you can't say no!' I put that in their minds. The cat named Mars looked at me, then back at the fire. 1 said, 'Go. Go.' She meowed, then made a perfect leap through the flaming hoops. The others followed." Dominique answers those critics who are concerned that a cat could get burned springing from one perch to another through fire. "I am the first one who does not want my cats burned," he explains. "When I light the hoops, I am far away: And the circles are large enough that they fly through without even a singe." In the beginning, Dominique worked with his cats four hours a day for three years. "But I don't do that with my new cats," he adds. "I think training is more a matter of sending vibes to the animals. It's very strange with cats. They understand what I want them to do and they want to cooperate. But it's important that they trust and like me." Affection is important, as well, he continues. "During the act, I rub Cossette's face and stroke the others from head to tail tip. Cats do have. minds of their own, but I think training them is a matter of love. And living in such close quarters, I understand my cats very well." cat bombarding her kittens with vibes to make them alert." A lover of the outdoors, Dominique takes advantage of his surroundings wherever he tours. In the Ozarks, he hiked mountain trails by clear streams and around expansive fresh- water lakes. As he travels cross-country, he stops to explore caves. And, characteristic of most Frenchmen, Dominique likes stopping in restaurants along the way. "I like to try new things, likethe beans and cornbread served in the Ozarks. However, I can't get used to corn on the cob. In France, we feed that to the cows!" In campgrounds or in the Key West marina, Dominique enjoys cooking and relaxing in his motorhome. "It's a fine house for me and my cats," the French performer sums up.